I took this a couple of weeks ago which was the start of his "explorings". 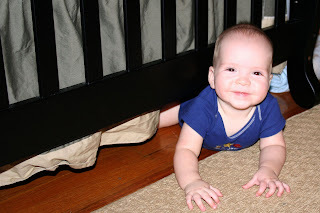 He doesn't crawl yet but he has figured out how to get around. I wish I had a video camera, I could tape him doing his twirls where he looks like a little dog chasing his tail. It's very funny to see. Not only does he love his daddy but he also loves his shoes. 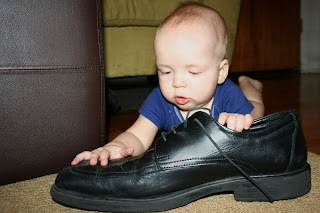 I'm not quite sure though that he'll ever get to his shoe size, not many grow to a size 14. Aaaahh! TEETH! If you look closely, you'll see his 1st tooth. I have mixed emotions about this little guy growing up and getting bigger. I'm excited to see him learn and progress but I'm also sad not to see him so small and precious. Well he's still precious of course, but you know what I mean. He's getting so big...it's time to start baby proofing your house if you haven't already! What a cute little guy! Nice to see new pictures. Just wait, it is so nice when they can get themselves dresses, feed themselves, go potty and get in the car and buckle themselves in! I am sure he is getting more fun to play with too. Such a cutie! What a HAM! No doubt he will be into trouble before long!